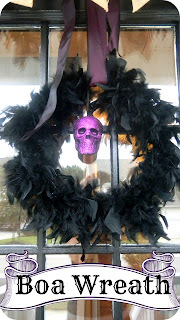 You can make a feather wreath for Halloween really easily. All you need is a feather boa, wire hanger, masking tape and some fishing wire. All you need to do is make a circle with the wire hanger using the making tape to connect the two ends. Then attach one end of the feather boa to the wire hanger using the fishing wire. Now all you need to do is wrap the boa around the wire hanger and attach the other end using the fishing wire. After this your wreath is ready, now it is up to you to haunt it with some skeletons, witches and goblins and stuff. Also if you want to see what one other person on the net did with such a wreath take a look at this easy to make Halloween wreath.